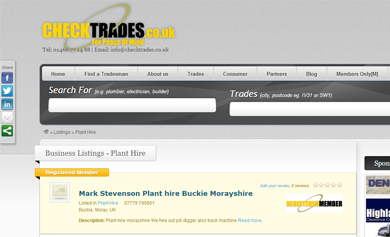 CheckTrades are a Company which provides Peace of Mind for householders when they are choosing trades businesses. Their aim is to bring good reputable trades businesses and the householder together. Trades Companies can apply for Membership to Checktrades Limited, they then put the trades businesses through their vetting process to ensure they come up to their high standards. This gives members of the public Peace of Mind when picking trades businesses to carry out work in their home as opposed to choosing someone from an advertisement randomly.